In celebration of Fashion Revolution Week, I joined forces with The Conscious Closet to create a short photographic series showcasing how you can recreate and be inspired by your favourite high fashion looks by shopping recycled! All clothing was sourced and styled from The Conscious Closet. I've shared each look below and included how we upcycled items to match the looks we were recreating. All clothing and accessories sourced from The Conscious Closet. We did have to do a bit of upcycling – daggy trim from the jacket cuffs and hem were removed, edges frayed. Skirt was cut and hemmed on the diagonal while a faux Chanel trim (ribbon) was added. The belt was too big so an extra hole was punched, before adding some chanel-esque jewellery and flowers… and, VOILA! The whole outfit was sourced from clothing at The Conscious Closet and the only thing we needed to change was the pants as the ones we found were too large. In this case we took in the waist band of the pants. 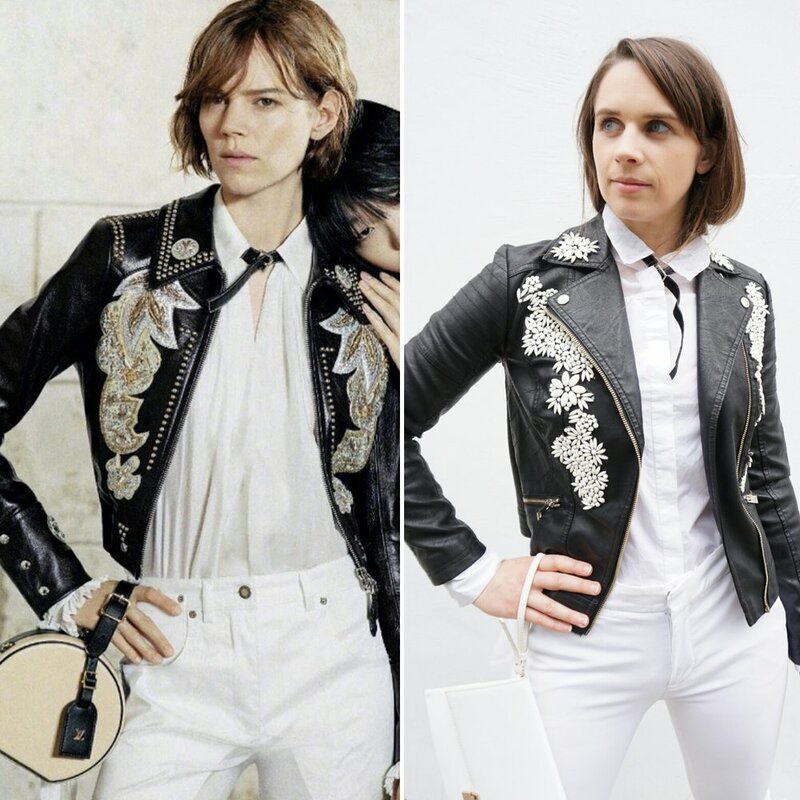 It was so much fun to upcycle this faux leather jacket using iron on jewelled motifs. We cut the motifs to create our own pattern and ironed them on being careful using a pressing cloth. We quickly knocked up a little black velvet collar tie, added some Zara white pants and a Witchery shirt and hello Louis Vuitton chic! We loved the colour palette in this campaign and recreated the look using a Gorman jumper, upcycled Asos leather jacket, Condotti pants, Max & Co Italian leather boots and a gorgeous little tan leather vintage bag. All we had to do was hem the pants to that (kind of awkward) 7/8 length, and added a sheepskin collar which can be added on or off depending on your mood! What looks would you like to see me recreate?? I can see this being a fun ongoing project! Follow along on Instagram | Facebook or Subscribe! I'm not sure about you, but I get attached to wallets. The most recent wallet I loved was a blue small wallet I had picked up at a thrift store in Belgium about 7 years ago. I used it everyday. Until it eventually got to the point where it would no longer hold my money or cards, and the clasp struggled to stay closed. But I couldn't let it go. The leather was perfectly malleable and soft, and so familiar. When it came time to replace it, I googled the worn out brand "Princess Gardner" and discovered it was an old brand who used to make wallets in the 1950/60's in the US. There were quite a few on Ebay so I managed to replace my old worn wallet with another much to my delight. However I was left with an old wallet that I couldn't bring myself to throw away so it's been sitting in a drawer. Flash forward 7 months, and I came across my old wallet last week, and knew I had to do something with it. The next question was what to make with the small amount of leather you could get from a cut up wallet. A leather tassel turned out to be the perfect solution. These are such versatile accessories which can be used as a keychain, a bag chain or you could even make two small tassels for earrings. It's falling apart at the seams!! I used the keyring off an ugly key ring which came on a bag I found at the opshop! And for bling I had an odd earring I had been hoarding for way too long. I didn't take any photos of the process so hopefully my instructions are clear, otherwise other people have much better instructions than I :). 1. If using an old wallet, you'll want to pull it apart and separate all the pieces including stripping out the lining. Keep the flap piece to use as extra leather to connect the tassel to the keyring. 2. Once you have your piece of leather, measure 2 cms from the top and draw a line. Start cutting long strips from the other side, I cut each piece about 4mm wide. Stop at the line you drew (this is going to be where you roll the tassel). 3. Take your short strip of leather, and fold it over the ring securing with hot glue (if adding attach your bling at this point). 4. Now place the short bit of leather at the top of the large piece and secure with hot glue then roll your leather and use hot glue at each roll until you get to the end. 5. Wait until the glue dries and your tassel is now complete! The options are endless, especially if you had some super colorful wallet or bag to put this on! Happy crafting. I recently celebrated my 30th birthday with a Murder Mystery dinner party game. I've been wanting to play one of these games for years. The particular game we played was called "The Brie, the Bullet & the Black Cat", set in 1942 Casablanca. The guest of honour was to have been France's greatest living mime artist, but he fails to arrive, and has been murdered! Everyone at the dinner party is a suspect. Aim of the game is to investigate who of your dinner companions is the murderer. It was a fabulous excuse to get dressed up, and act out in each character - here are my friends and family in their amazing outfits. I was so impressed with the effort everyone went to. Aren't they great? Big props to my mom who decorated the dining & sitting rooms, and organised ALL of the food, as I wasn't available during the day (sorry I don't have any photos)! Of course the majority of my outfit was thrifted. Months ago I found this stunning fur at the local Sacred Heart Mission op shop. On the same visit, I also found a vintage black feather hat (seen on my friend Lara in the selfie). Both pieces were so fabulous I took them home, I knew there would be an excuse to wear them one day. Plus, I feel like I could get away with the black hat as a winter hat; I'm determined to try to bring it into the modern age as an everyday piece. Watch this space. Here I am in my full 1940s outfit (apologies for photo quality). The dress ($10) was from Sacred Heart mission op shop South Melbourne, and the fur ($15) was also from Sacred Heart but their Prahran store. The fur has these really cool backpack-like straps, put your arms through them and voila it won't fall off! Earrings were also a thrifted pair; the shoes were the only item I had bought new. A Kate Spade pair I found at a clearance store on a trip to the US. You may not have noticed but it was 30 degrees Celsius (that's 90F) so the fur didn't last too long! My hair was curled a lot more but the heat and humidity ensured that didn't last long. Have you ever gone to a murder mystery party? If so, what did you like about it? I'm Emily, a local Melbournian in Australia. A lover of thrifting (or op shopping as we call it here! ), red lipstick, adventures, and tiramisu. Thanks lovelies for visiting my blog! Sign up to receive weekly emails of new posts. Thank you for signing up to my blog! Can't wait to share my thoughts and outfits with you.